The Rheem tankless water heater provides a compact and energy efficient solution for a continuous supply of hot water that won’t run out – even with the longest showers! Choose from gas or propane installations that can be customized to fit your needs. Enjoy demand-based hot water delivery. Endless and more efficient. 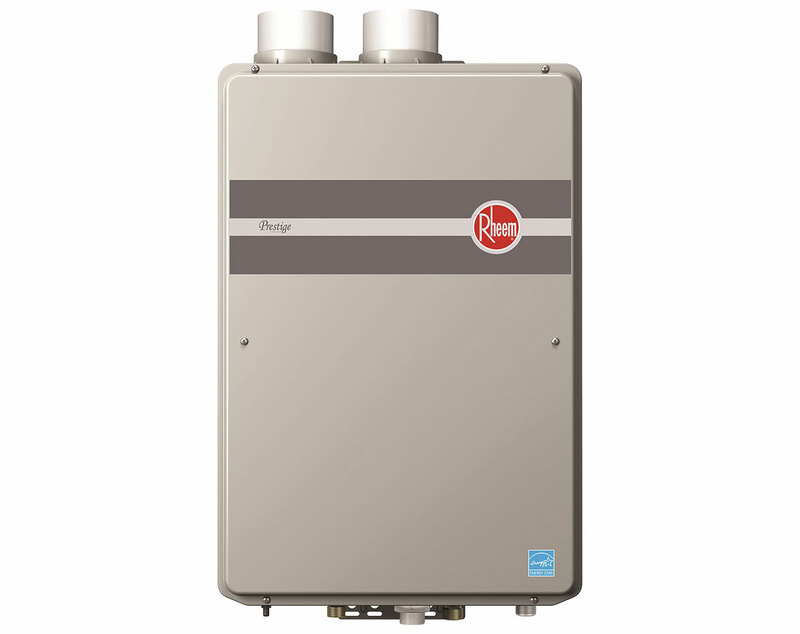 A Rheem tankless water heater is about 1/3rd the size of a traditional tank water heater. The Mid Efficiency model is about the same size as your carry on luggage. Who couldn’t use a little extra storage space? Tankless water heaters typically last as long as two traditional tank water heaters. • Precise temperature control. Remote control can be set up to 140 degrees. • Digital display shows temperature setting and maintenance codes. • Intelligent electronic controls increase energy efficiency and safety. Environmentally friendly Low NOx burner meets SCAQMD rule 1146 requirements. For high demand applications such as restaurants, nursing homes and schools, the Rheem EZ-link cable allows for the capability of connecting two tankless water heaters together as one. This expands capacity of these water heaters from what is needed by a house to what is needed by a business. Ask us about our commercial tankless water heater and boiler products. We have makes and models that are not shown on this website. Your Washington Energy commercial water heater expert will fit the right product to suit your needs. 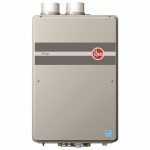 Is a Rheem tankless water heater right for me? Imagine having 4 people take a shower back to back and the 4th person getting perfectly hot water. Or how about doing the laundry and taking your shower at the same time. Never sit around again waiting for the hot water to heat back up. This tankless life is now possible with the Rheem tankless water heater. It’s an every day game changer. Loofahs and Egyptian cotton towels only go so far. Turn any bathroom into a luxury spa when you indulge in an endless shower or fill your large jetted tub. You deserve it. Tankless water heaters provide significant energy savings compared to traditional water heaters, but they are especially efficient when you are away from the home. That’s because tankless water heaters only turn on when you need the hot water whereas traditional water heaters are constantly running to ensure there is always a supply of hot water readily available. If it’s not running, it’s not using energy. Do you have electric tankless water heaters available? We sell plenty of electric standard tank water heaters, but as a company, we have chosen not to offer electric tankless water heaters. They are not energy efficient, and in most cases require an electrical panel upgrade to supply sufficient power. Additionally, cases of malfunction due to the product (not the installation) have been reported too often for us to make a 100% satisfaction guarantee to you. We stand by our high standards and only install the best brands and highest quality products. If we wouldn’t install it into our own home, we wouldn’t install it into yours. 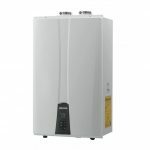 How much does a Rheem Tankless Water Heater cost? There are several important factors including, sizing your equipment for the number of bathrooms and people in the home, venting, gas line upgrades, and eligible utility rebates. We actively seek all rebates available to get you the lowest price possible. When Tankless Water Heaters first came on the US market years ago, they were twice as expensive as today’s models and had difficulties with cold water sandwiching. Quality and manufacturing improvements have brought prices down and quality up. We have been installing tankless water heaters for many years and our knowledgeable staff will provide you with objective advice along with a free estimate. Either fill out the form by clicking the free estimate button above or call us during our office hours and we’ll set you up with an easy no obligation free estimate. That’s our promise.